Nature's Best distributes a great range of high quality dog toys to entertain your playful pooch. With bright colours and designs, as well as fun textures and varying functions, each toy provides hours and hours of endless enjoyment for your furry friend. Whether you are looking to keep your dog occupied while you're away, or want to encourage some interactive play, Nature's Best has something for every dog or puppy. The Hartz Dura Play Dog Toy range features natural latex and a unique foam to provide hours and hours of fun with durability for dogs who love to chew. Dura Play also bounces and floats, and is suitable for all dog ages, from puppies who are teething to seniors with sensitive teeth. These are the ultimate toy for your furry friend! Dura Play toys come in a variety of colours and sizes. 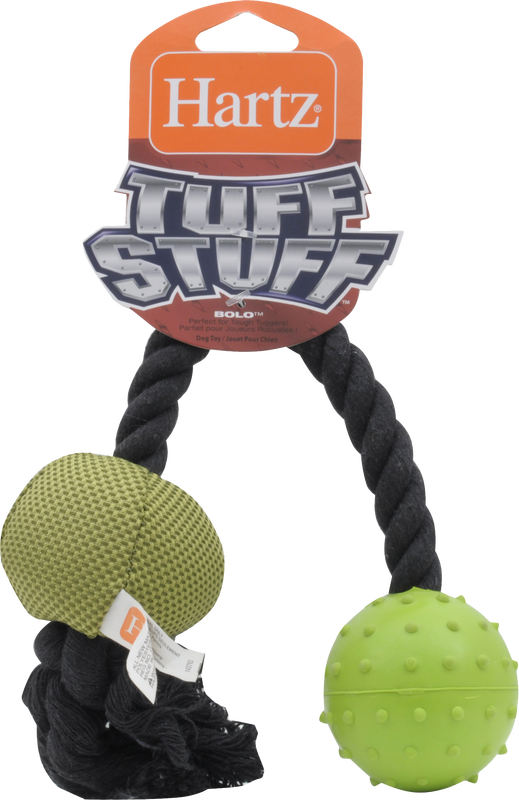 Made from ballistic nylon for durability and strength, the​ Hartz Tuff Stuff Dog Toy range is specifically designed to be strong against energetic dogs who love to chew. Encourage interactive play between you and your dog with this selection of entertaining dog toys! Hartz Tiny Dog dog toys are ideal for small dogs and puppies that love to chew, play and cuddle up. All toys also help to encourage interactive play between the dog and its owner. MultiTex Dog Toys contain a variety of elements and textures to satisfy your dog with endless amounts of fun and play! Knot Ordinary's rope dog toys are specifically designed to last with dogs who love to chew! Made with a nylon core and then wrapped tightly with braided nylon, these dog toys are hard to break! Helps to encourage healthy teeth and gums, as well as exercise. There are so many fun and entertaining dog toys, but very few are designed for smaller breeds of dogs. The R2P Waggish Dog Toy range is specifically designed for those small dogs. There is a wide range of dog toys available, made from eye-catching and durable materials in unique shapes that encourage hours of enjoyable playtime for your pooch. Whether your small dog wants to chew, tug, fetch or snuggle, there is a Waggish toy for every small dog. 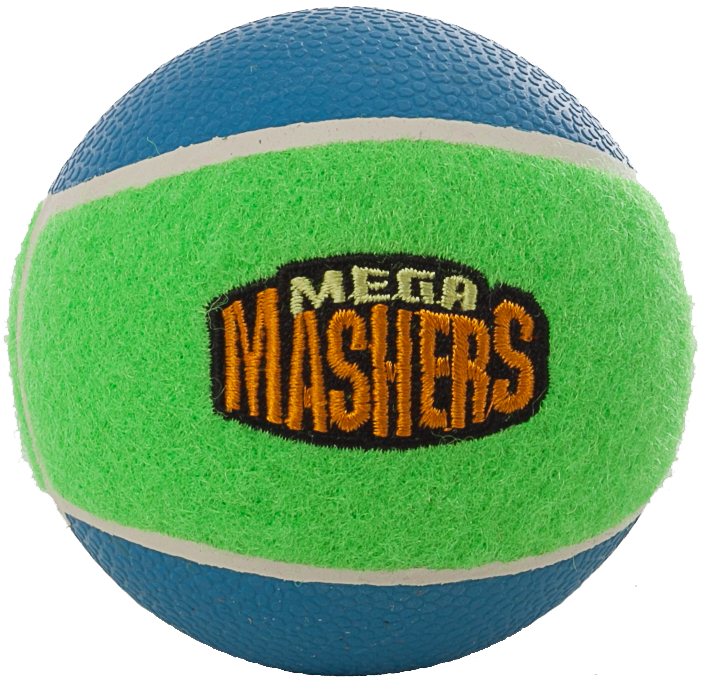 Mega Mashers feature a reinforced rubber core for longer durability and a more powerful bounce. With soft and dog-friendly tennis ball fabric, the Mega Mashers are gentle on your dog's teeth and massages their gums. Spoil your furry friend with the Playmate Tennis Balls -- the classic fetch toy that every dog will love! Incredibly bouncy and durable for playtime, your dog will be entertained for hours and hours with endless fun! For the ultimate play and exercise with your furry friend, the Playmate Ball Launcher Large is the ideal solution to enhancing a classic game of fetch. Pair it up with Playmate Tennis Balls! The COA Boomer Ball is specially designed not to be picked up by your dog, but rather chased and conquered. This means that the ball has to be large enough to not fit in your dog's mouth. It is typically loved by Bull Terriers and other "macho" breeds of dogs.